Latest Update: DD Freedish conducted recently 33rd e-Auction for vacant slots on DD Freedish. But this eauction is not completed because no any private broadcaster taken part in it due to hike of annual subscription of vacant slots. 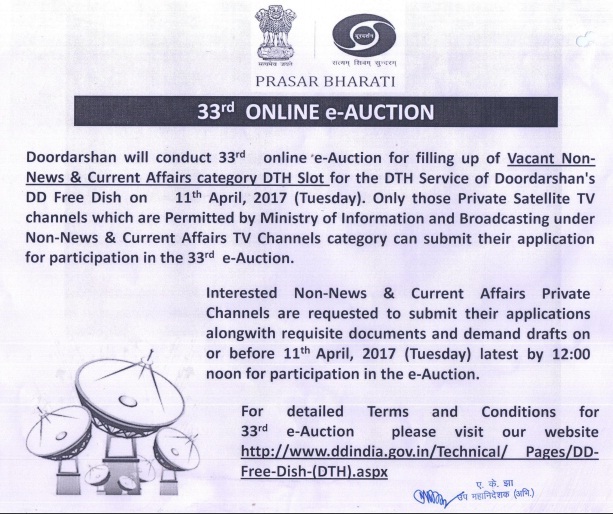 This is good news for DD Freedish subscribers because Prasar Bharati going to be conducts its 33rd online e-Auction for filling up vacant slots on DD Freedish DTH platform. 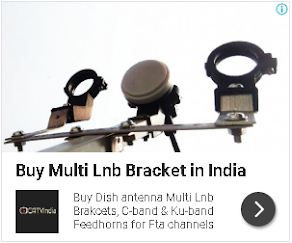 But this time DD Freedish is allowing only Non-news & Current affairs TV channels. It means no any news channel will be added in 33rd e-auction. DD Freedish conducting e-auction on 11th April, 2017 (Tuesday) till 12:00 noon. Here is press advertisements by Prasar Bharati. This will be the first auction of DD Freedish’s slots in the new financial year 2017-2018. So now interested non-news & current affairs private channels can take part this 33rd e-Auction on or before 11th April, 2017. You can check official information from here. Terms and Conditions of 33rd e-Auction to be conducted on 11-04-2017 (Tuesday). Press Advertisement of 33rd e-Auction to be conducted on 11-04-2017 (Tuesday). Bidder Registration Form of 33rd e-Auction to be conducted on 11-04-2017 (Tuesday). Bidder Manual of 33rd e-Auction to be conducted on 11-04-2017 (Tuesday).